Instapaper has temporarily shut down its service in Europe, having failed to get itself ready for the EU's new General Data Protection Regulation (GDPR) rules that come into force tomorrow. 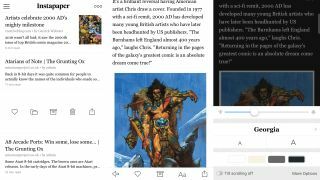 Instapaper, owned by Pinterest, is a read-it-later service that lets users 'clip' articles and pages. The shutdown will be particularly annoying for anyone who's clipped a bunch of articles, with the intention of reading them over the weekend, but Instapaper says it can "generate an export of your saves" if you email support@help.instapaper.com. "Starting tomorrow May 24, 2018, access to the Instapaper service will be temporarily unavailable for residents in Europe as we continue to make changes in light of the General Data Protection Regulation (GDPR), which goes into effect May 25, 2018. We apologize for any inconvenience, and we intend to restore access as soon as possible." GDPR is designed to give you (the 'data subject', as you're elegantly dubbed) more control over your personal information. It's also the reason your email inbox is groaning under the weight of messages from sites and services frantically updating their privacy policies. They've good reason to be worried. Companies that don't meet the standard face fines of up to €20 million (about US $23 million, £17.5 million, AU $31 million) or 4% of annual turnover – whichever is higher. The rules apply to all companies that do business in the EU – not just ones that are based there. However, it's not as though GDPR came out of the blue – the requirements were announced two years ago – and it's particularly surprising that a service owned by a company as big as Pinterest would be so slow to get its ducks in a row. The problem might well come from GDPR's requirement that companies give users a copy of all their data in a convenient format. That could be tough if your databases have been handled by contractors who didn't leave full documentation of all their work. In February last year, Instapaper ran into trouble and experienced 31 hours of downtime due to an undocumented file size limitation dating back to 2013. Once the problem was resolved, Brian Odonohue – former CEO of Instapaper and now product engineering manager at Pinterest – explained exactly what happened in a blog post. Hopefully we'll see the same transparency this time.